Saskatchewan has never been on my list of top places to go for wildlife photography. Having driven through the province several times before, it seemed all there was were farmers fields, a few rolling hills, grain silos and a scattering of trees. While these can be nice in the right light it’s not something that grabs me and makes me want to pull over for anything more than a pit stop (sorry to all those from Saskatchewan!). So it was with a bit of hesitation that I went there for a week to see what many consider the gem of the province; Grasslands National Park. With over 70% of native prairie grasslands gone due to extensive farming and oil and gas exploration in the province, GNP is an oasis for prairie species, many of which are threatened or endangered including the black-tailed prairie dog, prairie rattlesnake, short-horned lizard, loggerhead shrike, sage grouse and black-footed ferret to name a few! My visit completely changed my mind about the prairies and in the coming weeks I will post some of the moments that made my trip so incredible. The beauty in the province is much more subtle than in the Rockies and requires a bit more effort, but when you find it it’s well worth the extra effort! This photo was taken during a beautiful sunrise along the Frenchman River. 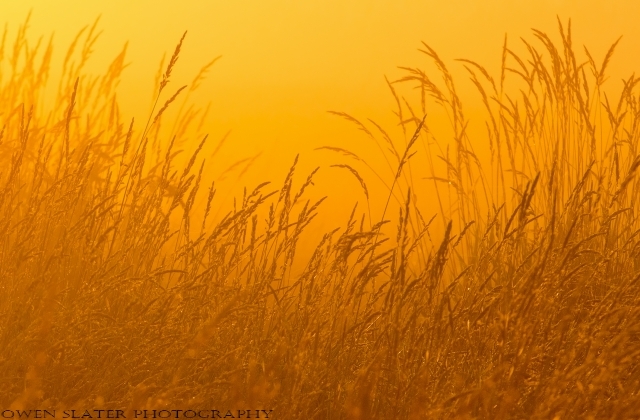 The fog was just lifting and created a golden mist in the surrounding prairie meadows.